Dubai’s luxury second home market is gaining traction as the Kleindienst Group prepares to hand over properties this year. The developer of the Heart of Europe, a cluster of six islands on The World, will hand over 40 Floating Seahorse villas, 10 Beach Palaces on Sweden Island, 32 villas on Germany Island and launch the Portofino Hotel. 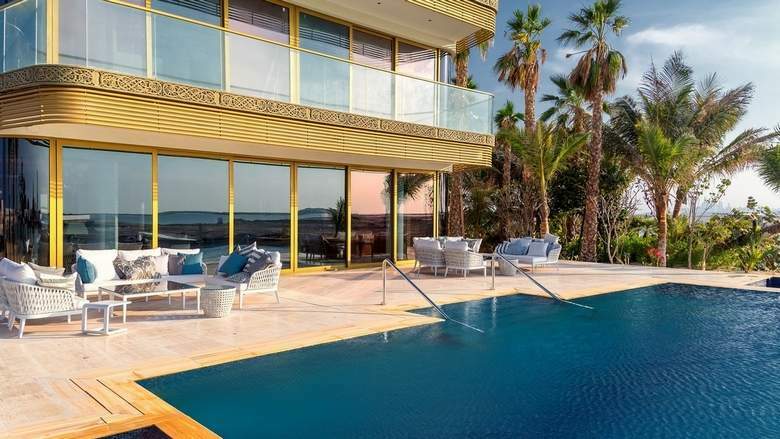 The promoters refer to the Heart of Europe as Dubai’s first purpose-built luxury area for UAE residents to own a holiday property in their own country. Until now, most holiday homes have been lapped up by international buyers. The second home market is a new concept for Dubai. While New York has The Hamptons and multiple cities in Europe have their own countryside and seaside getaway spots, Dubai has lacked an area where people leave their primary property and head to a second home for the weekend. “The second home market is not linked to the fortunes of the first home market. First homes are aplenty while second homes are short in supply,” Kleindienst said, responding to a question on the market’s performance. While the 10 Sweden Beach Palaces have been sold (one has been put up for re-sale for Dh100 million), there are Floating Seahorse villas available for sale. Of the 131 Floating Seahorse villas, 60 have been sold, with the price starting at Dh15 million. “It takes four months to build a Floating Seahorse villa and a typical unit lasts for 25 years. However, the ones we are building are more durable and will last much longer. The first buyers will move in during November or December this year,” added Kleindienst. When the developer started selling properties in the Heart of Europe, the average price was Dh2,000 per sq ft. Their target price on completion is Dh7,000 per sqft. Price for a Sweden Beach Palace has gone up from Dh30 million to Dh100 million today. The Beach Palaces were sold to two European buyers and the rest to GCC royals. Five of the palaces will be fitted out with Bentley Home interiors, while the remaining properties will be bespoke to the individual owners. Each property will incorporate a special snow room. Kleindienst Group aims to complete the entire Heart of Europe project worth $5 billion by 2020. “We paid for the island with our own equity and have added Dh1.5 billion of our equity in the project. We are not using bank finance and will fund the rest of the project through off-plan sales,” the chairman informed. Two of the biggest hotels are already under construction on Europe Island: the 488-room Portofino hotel and Cotes d’Azur (a French hotel) which will include both hotel rooms and hotel apartments. The developer will add 4,000 rooms in total through the 13 hotels planned in the project. “We are still in the approval stage for the Floating Venice hotel. We want to finish all the engineering work and start construction this year. We are targeting international tourists and UAE residents who are looking at staycations,” the senior executive said. There will also be climate-controlled streets on Switzerland Island and 51 restaurants across the Heart of Europe. While the islands of Sweden and Germany will be restricted to owners and their guests, Europe, St Petersburg and Floating Venice will be open to guests. The retail, entertainment and F&B space will be leased at a later stage and be ready by 2020.